My last collection of Hair Fair pictures highlights the most fantastical and imaginative hair you can find. I believe all of these were promotional copies though I may be mistaken. Several of these hairs are highly scripted, allowing you to customize hair color, fabric and metal colors, the colors of jewels, shells, and thingamabobs. The Crustacean hair from Tekeli-li totally cracks me up. It reminds me of the scene in Farscape where Crichton says “Cross my heart! Smack me dead! Stick a lobster on my head.” Most striking, I believe is the scripting in the Curio Oscura Pocketwatch that lets you change the time zone. The most daunting hair is the Rococo Fantastico that actually has three pairs of dancers waltzing in a ballroom in the middle of the pompadour – and scripting can change their clothing and the decor of the ballroom – along with everything else. 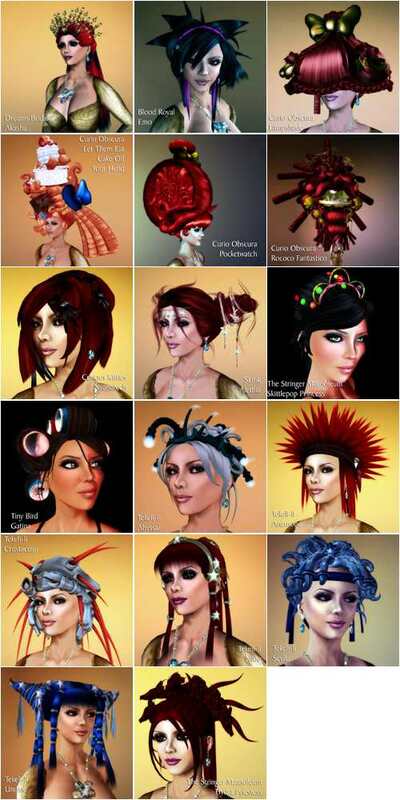 To see full-size pictures of these hairstyles, simply check out the set on Flickr. This entry was posted in Second Life on June 30, 2009 by Cajsa Lilliehook.